Visualize and compare indicators across counties. 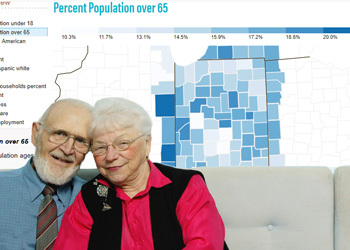 View census and general mortality data for Indiana counties, metros and health preparedness districts. Build your own regions using tract data. Then view data for your region as profiles or download tables. 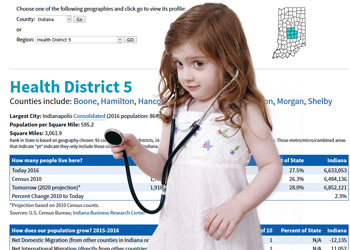 STATS Indiana: Indiana’s statistical data utility provides convenient access to a wide variety of data for geographic areas in Indiana and across the nation. IndianaMap: The largest publicly available collection of Indiana geographic information system (GIS) map data. Community Health Status Indicators: The goal of Community Health Status Indicators (CHSI) is to provide an overview of key health indicators for local communities. County Health Rankings: This sites illustrates what we know when it comes to what’s making people sick or healthy, as well as what we can do to create healthier places to live, learn, work and play. 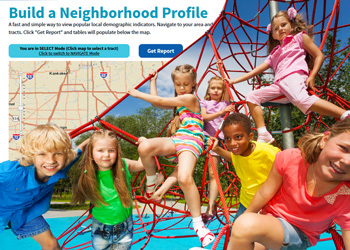 Kids Count Data Center: Explore hundreds of measures of well-being for kids across the nation, or in your state, city, or community. Community Commons: An interactive mapping, networking, and learning utility for the healthy, sustainable, and livable communities’ movement.